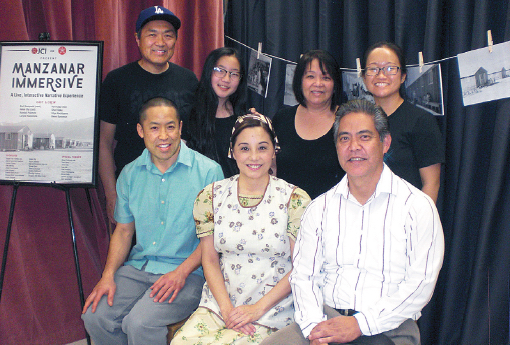 GARDENA — A classroom at the Gardena Valley Japanese Cultural Institute became a time machine on March 30 as Manzanar Immersive, a live, interactive, narrative experience, was presented three times. Created and produced by Randall Fujimoto, Manzanar Immersive shares important lessons about Japanese American World War II history in a hands-on, engaging environment, similar to an “escape room,” where participants are part of the show. It includes actors, prerecorded segments and props. Participants — both adults and children — worked together to solve puzzles, complete activities, and interact with actors Helen Ota and Kurt Kuniyoshi as they proceeded through the narrative of a Japanese American family’s wartime experience, starting with news of the Pearl Harbor attack and Executive Order 9066. Decisions to be made included what to take to camp — families were limited to what they could carry and some items were banned. “Every group wanted to take the dog with them and all were sad to have to leave their family pet,” said Ota. Participants were also faced with the loyalty questionnaire that was imposed on incarcerees. Two questions, 27 and 28, were controversial for a variety of reasons. For example, agreeing to “forswear” allegiance to Japan’s emperor implied that Japanese Americans were loyal to Japan. And some incarcerees said they wanted their constitutional rights restored before they would pledge to serve in the armed forces. “One group talked about how incredibly difficult it must’ve been for families to answer the questions because they were imprisoned in camp,” said Ota. “Another group thought both questions were essentially the same question and thought it was a little confusing and unfair. In addition to helping people learn about Japanese American history, culture and values, the experience is intended to teach learning skills, such as collaboration, communication and empathy. At the end of each showing, participants gave their feedback to the cast and crew. The crew also included Loryce Hashimoto, Keri Kaba-Dien, Shari Kaku, Aliya Kochiyama and Glenn Suravech.